I have long been interested in those big bold fighting knives that Pieter Bruegel shows XVI century peasants wearing in his paintings. Especially the one in the "Peasant Dance" of 1568 (see detail of it in attached picture). This is basically a messer with a roughly heart shaped nagel, long knuckle guard, and short straight back quillon. Pommel is not visible but I imagine a typical messer style curved buttcap would fit it well. 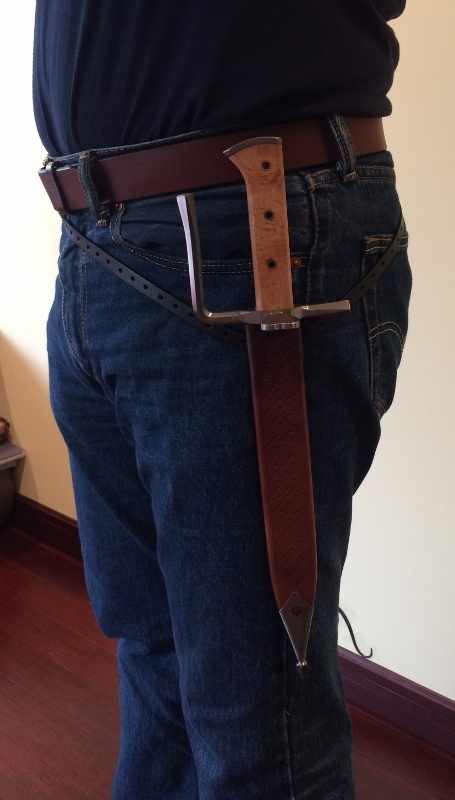 Scabbard has a metal chape, and is worn on a very narrow, rather loose hip belt. Recently I finally ran into a more or less suitable blade for this project: a Rifleman blade sold by Crazy Crow (it was discussed on this thread: http://myArmoury.com/talk/viewtopic.php?t=11707&start=66 ). Not quite what I wanted (a little short at 11", should have been several inches longer) but close and very cheap. So I decided to do this project as a learning experience - I have never before done a Messer style hilt and wanted to try. I had to put a lot of effort into modifying/fixing the tang (discussed in detail on the above thread) but in the end it came out pretty well. The blade is approximately 3/16" thick, and with some "reverse distal taper"! I mean it is 11/64" at the guard and 13/64" at the start of false edge. Cross section is rather thick, and I sharpened it with a convex edge to preserve strength (since it isn't very hard, I would say like machetes typically are). So it is a front heavy beast for its length, which is actually good for this project - has a feel of a decent chopper it is supposed to be. Kind of compensates for relative shortness. The guard, nagel, buttcap, and scabbard fittings are all 1018 mild steel satin finished to 220 grit, blade 400 grit. 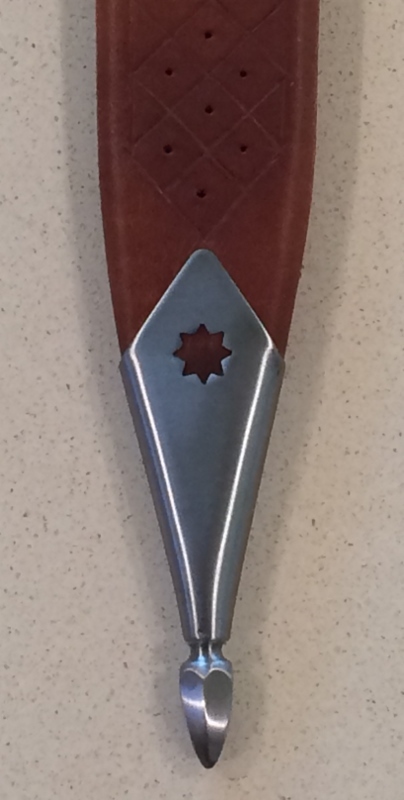 I imagine this level of finish (rather than mirror polish) would be a reasonable expectation for a XVIc peasant's weapon. Handle scales are curly maple, finished with tung oil, fixed with 1/4" brass tube pins. Overall handle is 4 3/4" long, 3/4" thick. Scabbard is thick leather, hardened in hot beeswax. This treatment made it contract by over 1/4" in length, so I had to add a rather awkward extension covered by steel collar (wasn't planning on it originally). The blade to scabbard fit turned out very tight (because of the blade's reverse distal taper which I didn't think of until too late), takes something like 20 lb of pull. So leather work was only a partial success. But I like how the chape turned out, this is the first time I managed to fabricate a chape with a finial at the end rather than just a flat bottom. Some more pictures. 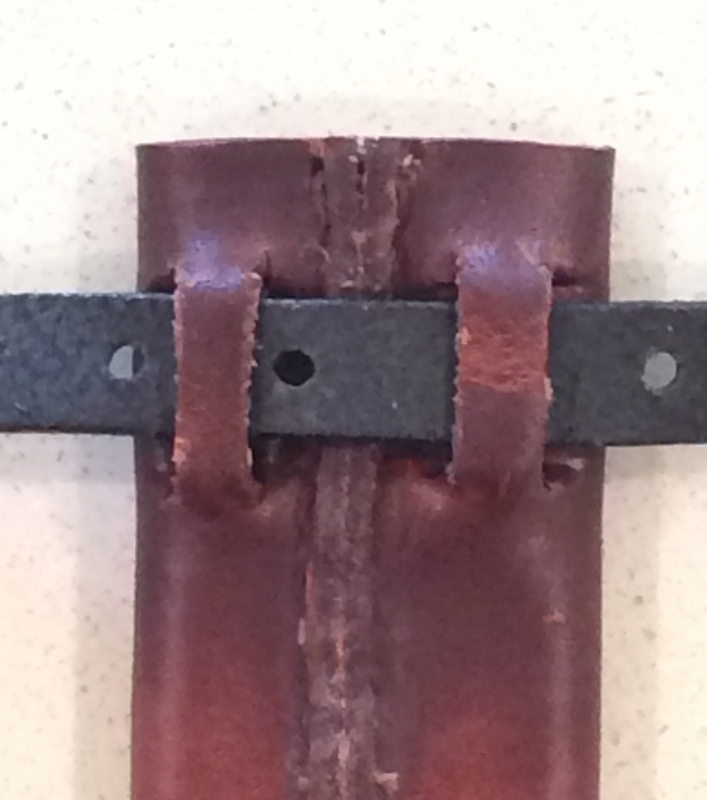 Note the loops formed on the back of the scabbard to fit 1/2" wide belt tightly. I tried this on a scrap piece of leather first and tried to tear it off - turned out the arrangement is much stronger than it appears (especially with hardened leather). Very good work - from documentation to execution. You should load your pictures on photobucket and link them here - shame not to get full pics displayed on your post. Very nice work on the hilt, and the bevels and geometry looks near perfect. I personally prefer a satin finish over a mirror finish so I like your choice of doing a satin finish. A mirror finish with a lot of use would show the smallest scratch and hard to maintain, with a satin finish it's easy to sand out minor scratches or remove staining unless one want to leave a natural patina if it develops. In any case good work. Julien, I took a quick look at photobucket free account and description says "The free account does not allow any image linking or 3rd party image hosting. If you are interested in image linking and/or 3rd party image hosting, you will need to subscribe to one of our Paid Accounts. " Is this true, even with the "myArmoury photobucket fix"? You use image linking feature to post photobucket pictures here, right? Very nice work! 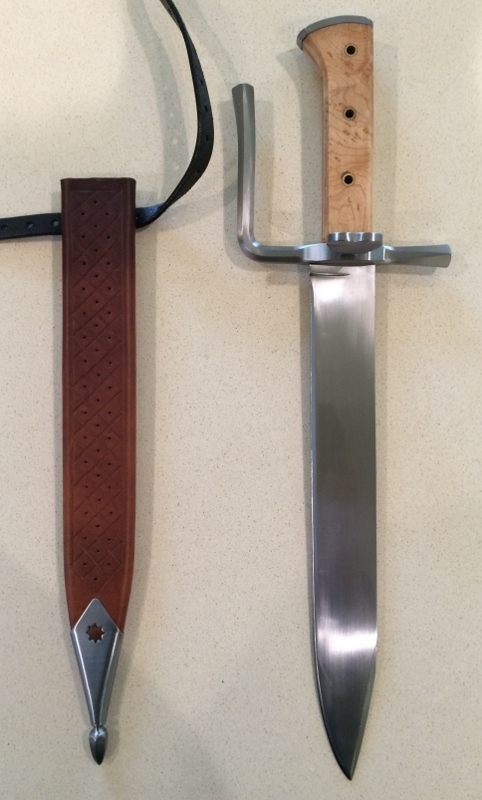 Some of my first bauernwehr were made from those Crazy Crow blades. Really not bad stuff, and you can't beat the price. Just be sure to check them out well. Many are re-purposed EN45 from older leaf springs, and can sometimes still have signs of their previous lives. 1, IIRC Bruegel isn't really a fan of DD1-2 pommel plates on these blades, most of his renditions show a grip without any kind of pommel or pommel plate. There is one on the Dutch Proverbs, in the hand of the cuirass&shirt guy headbutting the wall, but I can't find any other in his work. 2, I think the painting shows the belt doing a 90° "turn" right at the scabbard so the blade hangs at about 45°. We did such a belt recently, and Tod's Stuff did a far nicer pair of that not long ago. However, Bruegel does show these short Messers hanging vertically too, for example on the same painting you used, the bagpipe guy has such a suspension. Basically the aim this project wasn't so much an exact copy of the messer from the painting, as a trial run for constructing what I think of as the "classic" messer handle. It worked out well enough, so at some point I would like to build a more properly sized (short sword length) messer along the same lines. The problem is finding a more or less suitable blade for modification, at an affordable price.BTW, if anybody can suggest such, I wold appreciate it. Can you post a link to pictures/description of how "the belt doing a 90° "turn" right at the scabbard" is made? I am not sure I can visualize what you are talking about. Here's Tod's thread with that kind of suspension I meant. Also, in case I wasn't clear about this - everything you did is present in Bruegel's work, so I think it is indeed clearly inspired by him. I'm sending you a PM about blades. I really can't see anything like this kind of suspension (a wide 90° belt fixed around the top of the scabbard) in the several Bruegel paintings I have saved. There it is always a very narrow belt, slung relatively low on the hips, passing behind the top of the scabbard. If sometimes the messer is shown hanging at some angle, I believe this is simply because the massive asymmetrical guard pulls it off vertical. We never experienced a knucklebow pulling that much on a scabbard with a straight suspension. Combined PoB will be below the suspension point, and by quite a lot (there's very little point in a close PoB on a fighting tool, the majority of original Messers have theirs well above 100mm), so it should hang vertically, as it indeed does on several of Bruegel's characters. On the other hand, it is possible that the character just kicked the end of the scabbard while dancing. The more I think about, the less sure I am actually. Posted: Mon 03 Dec, 2018 7:18 pm Post subject: New sheath made. Resurrecting the thread as I finally went back to this project and did what I should have done right away - junked the scabbard with its ridiculous throat extension and herculean pull effort. Made new one along the same lines but leaving proper allowance for shrinkage, not soaking the inside with wax, improved decoration pattern, and a bit more generous belt loops. Reused the chape from the original scabbard, there was nothing wrong with it. Now it fits just right and looks much better!